Most studios would be content with a re-launch of their game making it a massively played best-seller, but Hello Games have more planned for their procedural space sandbox, No Man’s Sky. The studio have their first season of community events planned out, and the first, detailed in this official blog post, goes live today. Buckle your swashes and put an eyepatch on your space-helmet, as there’s a hunt on for buried treasure in a remote corner of the galaxy. It’s not a massive undertaking, but should help bring its community together in search of underground loot and some extra cosmetic items, with more goodies coming in the following weeks. Players logging into No Man’s Sky who have completed their first Space Anomaly mission will find themselves with a new goal assigned by Polo and Nada. They’ll point you off to a far-flung corner of space, where you’ve got to dig for strange objects that have begun spawning underground. Return them and the explorers will exchange your findings for a new currency, Quicksilver. This in turn can be spent at a new shop aboard the Anomaly. Right now there’s only a handful of items (some of which you can see below), but this number will grow to over fifty in the next few weeks. 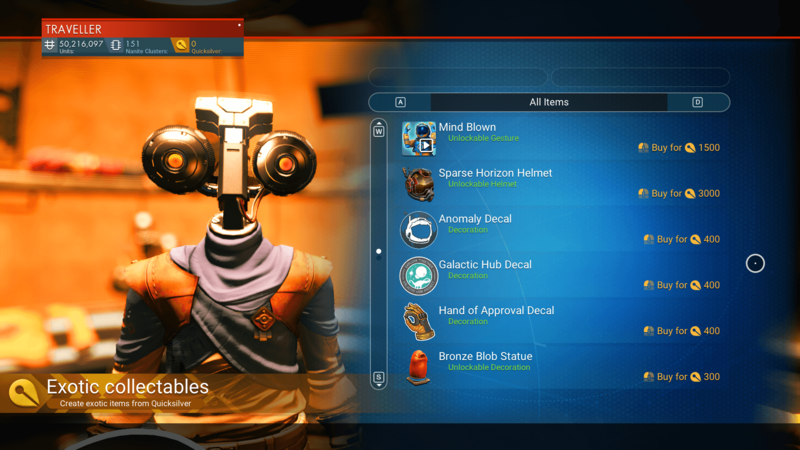 At the moment the rewards are entirely cosmetic (including a fancy new helmet for use in the character editor), but it sounds like there’s more interesting things on the way, including new base parts and exocraft. Alongside this event, the Galactic Atlas website has been improved, letting you find regional community hubs (and their warp-gate addresses) more easily. Do note that the Galactic Atlas only covers the Euclid galaxy – if you’re wandering through real deep space, you’ll have to trade addresses the hard way. Also released today is yet another patch – version 1.58. You can see the cumulative change logs since the release of No Man’s Sky Next here. There’s a lot.